Between 1974 and 1983 Tangerine Dream founder Edgar Froese issued six solo albums, and all of them are well worth investigating. The pick of the bunch, however, is this 1975 album, a dreamy and mysterious set which sounds as if it could be the soundtrack to some long-lost Werner Herzog jungle epic in the mould of 'Aguire, Wrath Of God'. Of course, Froese and Tangerine Dream would, from 1977's 'Sorceror' onwards, go on to enjoy a lucrative side career creating ambient movie soundtracks for directors such as Wiliam Friedkin, Michael Mann and Kathryn Bigelow, and much of that work stems back to 'Epsilon In Malaysian Pale'. Featuring just two, lengthy, side-long tracks, this may be a Edgar Froese solo album in title, but the reality is that it is essentially another excellent Tangerine Dream album in the mould of such classics as 'Rubycon' and 'Phaedra'. For reasons best know to it's creator, Froese remixed the album for it's 1990's CD debut, so the only way to really hear this superb album is on the original vinyl release. The CD version is still excellent, but the misty quality of the original mellotronic sound has been replaced by updated synthesizers, therefore subtly altering the highly-atmospheric dynamic of the original. 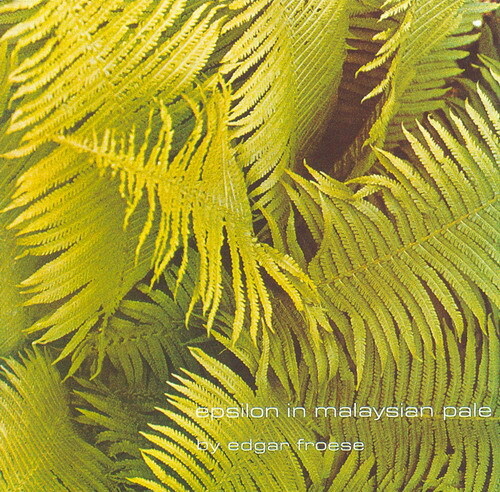 In it's original glory 'Epsilon In Malaysian Pale' really is wondrous, matching anything issued under Tangerine Dream's name(big words, I know) and showing that, in the end, it's really all about Froese despite the excellent contributions over the years from his fellow Tangerine Dream members past-and-present. Lush, warm, hyptonic and at times completely beautiful, this is the ultimate showcase of Froese' prodigous talents, and surely one of the great ambient albums of the 1970s. Bursting with slow-burning atmosphere and obviously lovingly-crafted, this is thoughtful, cinematic and richly-textured music that has stood the test of time remarkably well, sounding as rich and dense now as it ever did. To put it bluntly, 'Epsilon In Malaysian pale' is simply outstanding.